Download a print ready version of the National Mall Service map here. When did the National Mall service begin operating? 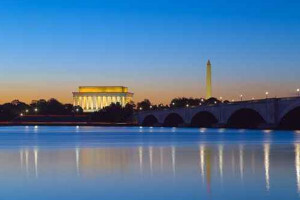 The National Mall service began operating in June 2015. Does the new route offer interpretive services like a sightseeing tour? 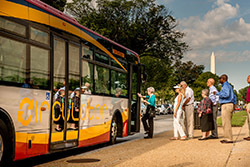 No, the Circulator strictly provides a transportation option to and from the National Mall. Sightseeing tour companies continue to offer narrated services for visitors. 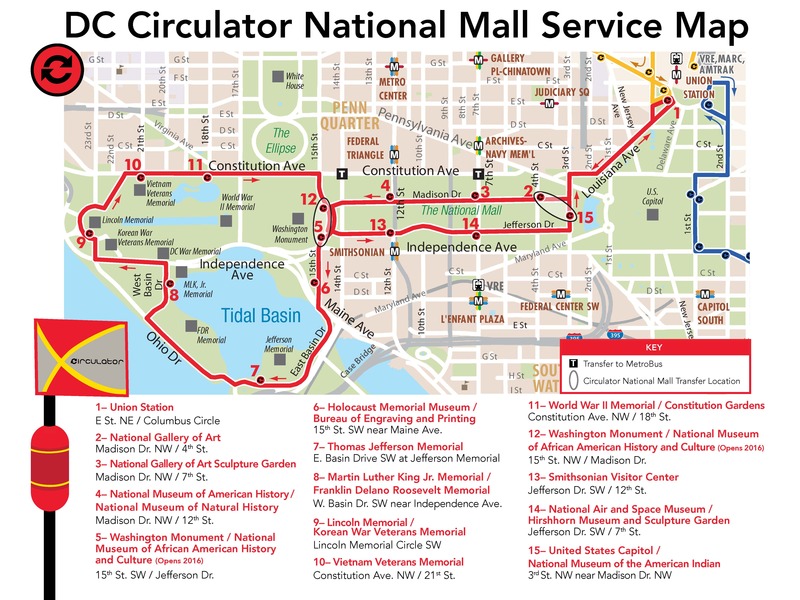 How is this service different from the previous Circulator route that served the National Mall? 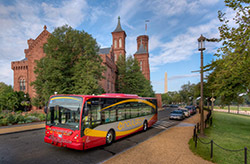 The previous Circulator route served areas around the National Mall but did not travel on the interior National Mall streets. It also had infrequent service, limited hours of operation and did not serve key attractions such as Union Station. 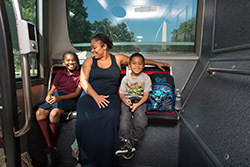 The new National Mall service offers highly visible and frequent service along a prominent route that is fully integrated into the larger local and regional transit network. 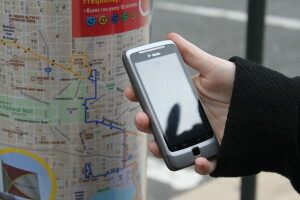 Which monuments and museums can I access using the Circulator? It also stops in front of the U.S. Capitol. View the official National Mall service map here. What do the buses look like? The buses are consistent with the vehicles used on other Circulator routes. 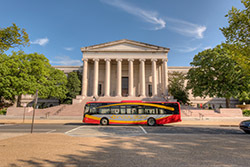 Riders can identify buses offering service along the National Mall by the reading the marquee located above the front windshield of the bus. How much does the National Mall service cost? 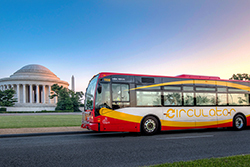 The entire Circulator system, including the National Mall service, costs just $1. All buses accept the SmarTrip® card, Circulator passes or exact change in the form of coins or dollar bills. Please see the Payment Options Quick Guide for more information. Can I exit and re-board the Circulator at a later time? Riders who pay using a SmarTrip® card are able to re-board the circulator for free within two hours from the time they first board the bus. Because we cannot keep track of cash payments, riders who use cash will be required to pay $1 each time they board the bus. Are printed maps of the National Mall service available? View a PDF of the National Mall service map here. 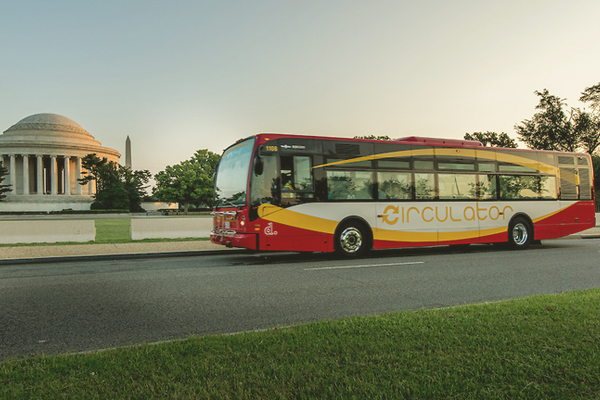 DC Circulator maps, that include the National Mall service route, are available on every Circulator bus. They are also be available to order by visiting CommuterPage.com’s free brochures by mail page. 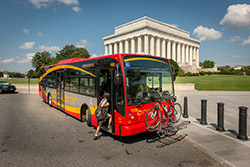 Simply select DC Circulator Bus from the menu and enter your contact information. 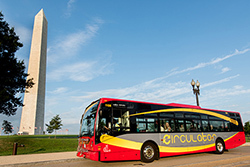 The Circulator brochures are sent right to your home or office, free of charge. See our Payment Options Quick Guide for a detailed list of payment options accepted on Circulator. Do I need exact change to pay? Yes, you need exact change to pay. Drivers do not carry cash and are not able to provide cash or change back. Circulator accepts coins and dollar bills. The most efficient form of payment is the use of a SmarTrip® card. What is the age for senior fares? The age for senior fare is 65 years or older. 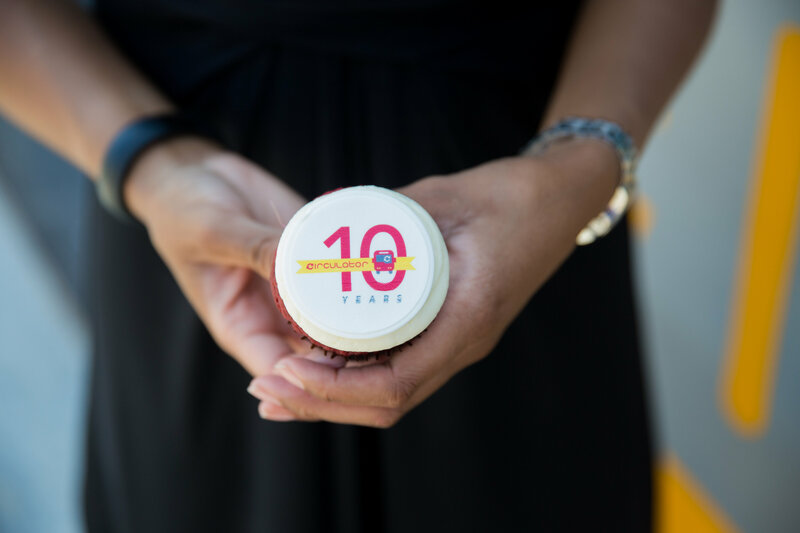 Discount is taken from Senior SmarTrip® cards, which can be purchased from WMATA (Washington Metropolitan Area Transit Authority). For seniors paying cash or with the Senior SmarTrip® card, the fare is 50 cents. All transfers for seniors are free. Is it free to transfer from Metro? 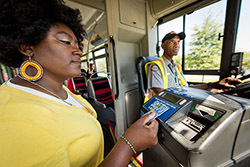 Circulator uses a paperless transfer system – passengers using their SmarTrip® cards receive free transfers within two hours from Metrobus to Circulator. All passengers receive free transfers from Arlington Transit buses to Circulator. Passengers transferring from Metrorail to Circulator receive a discount of 50 cents. All transfers for seniors (65 and older) are free. Can I bring my bike onto the Circulator? Each Circulator bus is equipped with two bike holders on the front. Visit our Bikes on Circulator page for instructions and tips. Will my stroller fit on a Circulator? 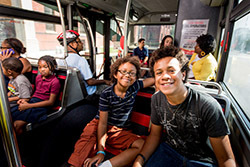 Strollers and children are welcome on the Circulator. We do have size guidelines for strollers. Visit our Strollers on Circulator page for details. 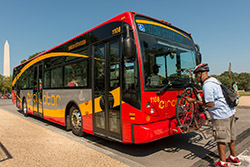 Do Circulator buses accommodate wheelchairs or motorized scooters? All buses are equipped to accommodate wheelchairs and motorized scooters and are designed with low floors and low floor ramps for accessibility. Designated areas with wheelchair securements are located on each bus. What are the National Mall service’s hours of operation? 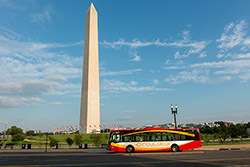 Like all Circulator buses, those on the National Mall arrive every 10 minutes during normal service hours. To see real time arrival information for all in-service Circulator routes, visit our NextBus page. If you have left an item on the bus, please fill out our Contact Us form as soon as possible with the route you were on, time of day and description of the item(s). We will try our best to locate the item and return it to you. Yes, service animals are allowed on the Circulator buses. All other animals or pets must be contained in a crate or container. How will I know if there is a service alert? 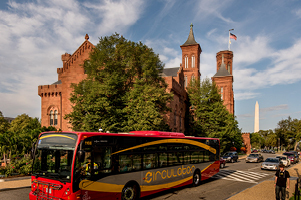 You can follow us on Twitter @DCCirculator. When a delay or service disruption occurs, we use Twitter to get the word out quickly. You may also find real time service alerts at the bottom of our home page. Predetermined service and route changes are located in the News and Press Releases section of our website. These changes will occasionally occur due to holidays and special events, such as marathons or marches where roads will be temporarily closed. 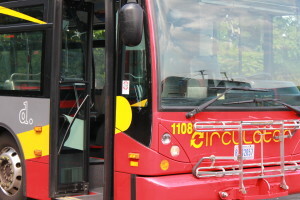 If you would like to receive Circulator service alerts, news and updates, please sign up here. 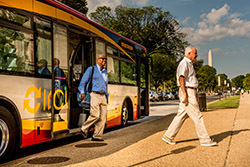 SmarTrip Card®: A permanent, rechargeable farecard you can use to pay fares and transfers on Circulator, Metrorail and more – simply tap your card when you enter the front door to automatically pay your fare. You may buy or add value to your SmarTrip Card® at any Metrorail station or at Metro sales offices, retail outlets, commuter stores and CommuterDirect.com. Passes: You may purchase passes online at commuterdirect.com. Members of the media interested in photos, or b-roll footage, for publishing click here to secure a password to view and download full size photos. 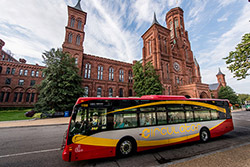 Today, Mayor Muriel Bowser, National Park Service Acting Superintendent Karen Cucurullo and District Department of Transportation Director Leif Dormsjo announced that the DC Circulator will begin passenger service along the National Mall this Sunday, June 14, 2015. 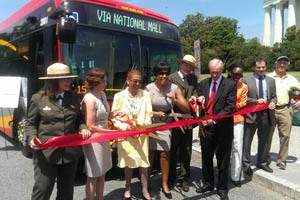 Tomorrow, June 12, Mayor Muriel Bowser will join Congresswoman Eleanor Holmes Norton and National Park Service National Capital Regional Director Bob Vogel at a ribbon-cutting ceremony for the launch of the new DC Circulator National Mall route.